ORLANDO, Fla. and CHARLOTTE AMALIE, Virgin Islands, June 29, 2018 /PRNewswire/ -- Wyndham Destinations (NYSE: WYND), the world's largest vacation ownership and exchange company, today announced the reopening of its Margaritaville Vacation Club® by Wyndham resort on the island of St. Thomas in the U.S. Virgin Islands. The resort reopened to Margaritaville Vacation Club owners and their guests for the first time since a combination of hurricanes struck the island in September 2017. Wyndham Destinations President and Chief Executive Officer Michael Brown, and several members of the company's leadership team, traveled to St. Thomas to personally recognize the extraordinary efforts of the resort team and to join them in welcoming owners and guests to the resort. "It is truly a privilege to be here in the Virgin Islands with our dedicated team as we reopen this spectacular Margaritaville Vacation Club resort. This milestone was made possible after the many months of hard work and commitment of General Manager Rodney Renner and our extraordinary colleagues. On behalf of our global Wyndham Destinations family, it is my honor to personally recognize all they have done to prepare for the return of our owners and guests. 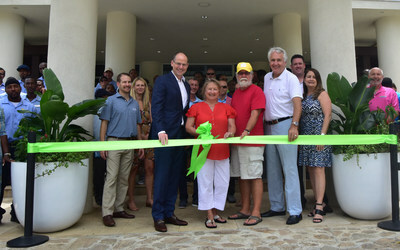 We are proud to support the rebuilding of St. Thomas and are so glad to welcome visitors back to the island," Brown said during a ribbon cutting ceremony to mark the resort's official reopening. In addition to the staff that remained throughout the restoration process, the resort hired 41 people this spring to help prepare for the reopening and to join the team of full-time employees, which exceeded the company's hiring projections. "Our entire organization is inspired by the perseverance and professionalism of the Margaritaville Vacation Club team in the Caribbean. Both in St. Thomas and in Puerto Rico, our remarkable staff members have shown such resilience after last year's devastating hurricane season. We are inspired by their tenacity and share their enthusiasm for this amazing destination," Brown also noted. Following the ceremony, he and his leadership team toured the resort, met with associates and greeted arriving owners and guests. While in St. Thomas, the Wyndham Destinations leaders also visited the company's nearby Elysian Beach Resort and Bluebeard's Beach Resort, where renovation efforts continue. "The reopening of Margaritaville Vacation Club by Wyndham is another positive step which contributes to our ongoing efforts to rebuild the territory's economy. Their support contributed significantly to our recovery efforts. As they welcome back club members, we look forward to extending the warm hospitality for which the U.S. Virgin Islands is known," said Commissioner of Tourism Beverly Nicholson-Doty. The U.S. territory averages more than 2.5 million visitors annually, according to the U.S. Virgin Islands Bureau of Economic Research. Located on Water Bay at the eastern end of St. Thomas, this unique resort is renowned for vacations inspired by the lyrics and lifestyle of singer, songwriter and best-selling author Jimmy Buffett. Here, the Margaritaville® Restaurant serves up island-inspired food with a twist, including that juicy Cheeseburger in Paradise. Guests can also enjoy a salty margarita, ice-cold LandShark Lager or boat drink at the 5 o'Clock Somewhere Bar. The resort offers studio, one-, two- and three-bedroom suites, each portraying a nautical feel. Fully equipped kitchens include a bar area complete with Frozen Concoction Maker® and all rooms have a relaxing outdoor seating area. Through its Wyndham Vacation Clubs business, Wyndham Destinations markets and sells vacation ownership interests and provides consumer financing to nearly 900,000 owners at an unmatched portfolio of brands including: CLUB WYNDHAM®, WorldMark® by Wyndham, CLUB WYNDHAM® ASIA, WorldMark South Pacific Club by Wyndham, Shell Vacations Club, Margaritaville Vacation Club® by Wyndham and WYNDHAM CLUB BRASILSM.